For a wide selection of quality utility trailers in Fredericton, look no further than Northside Auto Parts. Our robust and durable, galvanized steel K-Trail trailers have been designed to help hunting, fishing, quad, and snowmobile enthusiasts maximize their enjoyment of leisure activities and efficiency at work. It’s important to identify your needs before buying a trailer. There’s a size and weight limit for every unit, and the trailer’s stability and the maneuverability of your vehicle depends on how well it can carry its load. That’s why K-Trail and Ideal Cargo are always true to specifications, ensuring you have the perfect ride every time. 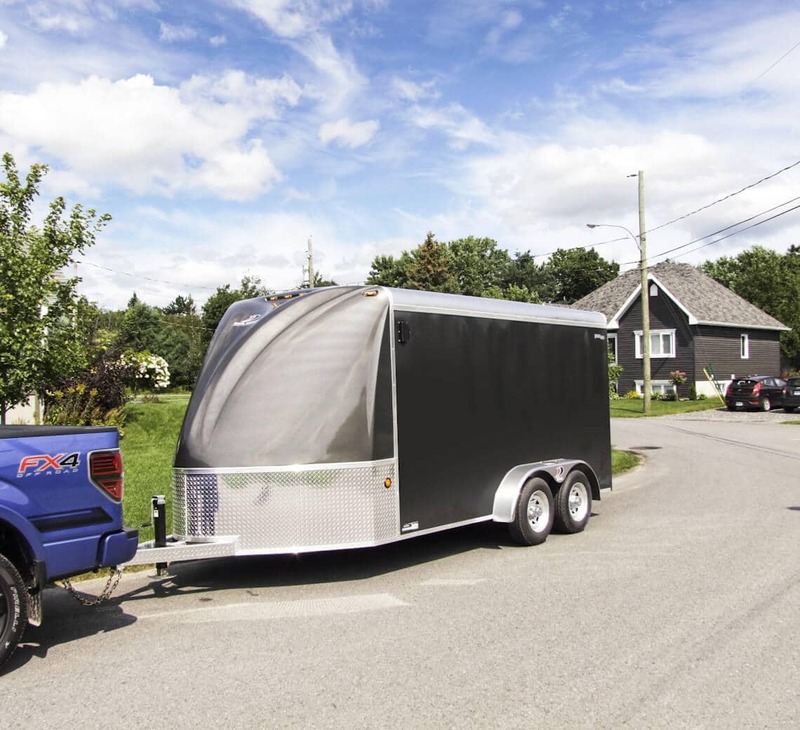 Northside Auto Parts is the destination for trailers in Fredericton, NB because of K-Trail. These utility trailers are the best choice for gardeners, hobbyists, anglers, outdoorsmen, and general use for all sorts of hauling needs. These trailers are made from hot dip galvanized steel for superior corrosion resistance and longer service life. The wiring is hidden, so you don’t have to worry about snagging anything while it’s in tow. It’s also safer electrically, meaning you can attach, detach, or move around the trailer at peace. Every utility trailer comes with radial tires and a bracket for a spare tire. Robust and versatile, the K-Series is designed for the hunter, fisherman, boater and gardener as well as for carrying the quad, snowmobile and small machinery. These trailers are made with four sturdy anchors on four sides, welded step plates, and a folding ramp. For the serious outdoorsman or hobbyist, these lightweight trailers are robust and competitively priced. Combining lightness and sturdiness with competitive pricing, the Sport Series was designed to transport ATVs, side-by-side vehicles and snowmobiles. It also remains a versatile trailer and offers low wind resistance. 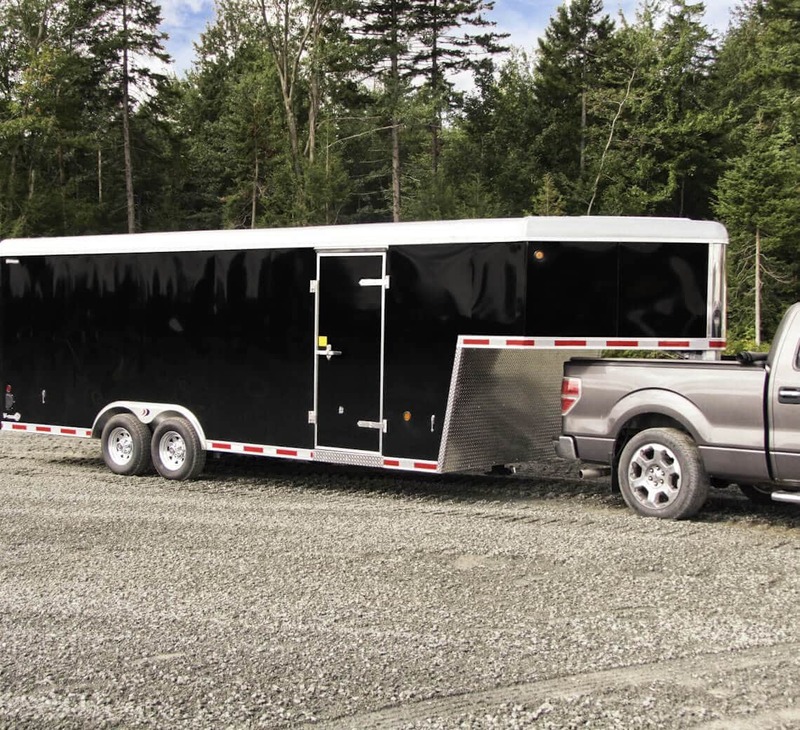 These are the perfect haulers for your ATV or snowmobile, and their light-weight construction allows Sport Series trailers a high degree of mobility. The Deck Series features heavy-duty, heavy-load, and heavy-use trailers for for transporting machinery, tractors, excavators or cars. The Deck and Bumper trailers are rated to carry equipment over 10,000 lbs, with several add-on options. You will be able to carry your working tool wherever you need it! The Expert Series includes hydraulic dumpers built to work hard. They are used by construction contractors, excavators, nurseries and for transporting firewood. It’s loaded with features such as a spreader chain, hooks for tarps, and slipper suspension for safe transportation and controlled dumping. You can also transport your machinery thanks to an optional system of heavy-duty ramps. More than ever, Ideal Cargo adapts to your needs with its new EVO 3.0 series. These cargo haulers offer maximum protection from external factors such as rain, mud, and wind. If you’re transporting precious cargo and hoping to preserve its showroom quality, you have great options with Ideal Cargo. Select the model that best meets your needs, and discover the four trailer groups (Zones). Then contact Northside Auto Parts, your destination for cargo trailers in Fredericton, NB. The Avantages model, supported by Duracore technology, offers the best value for the entire range of Ideal Cargo products. We use quality materials and up-to-date manufacturing processes to develop a more economical trailer suiting your every need. The V-Nose model is designed to maximize the interior storage space. It is a model with a very stylish appearance. It is also a more aerodynamic model due to its V-Nose. 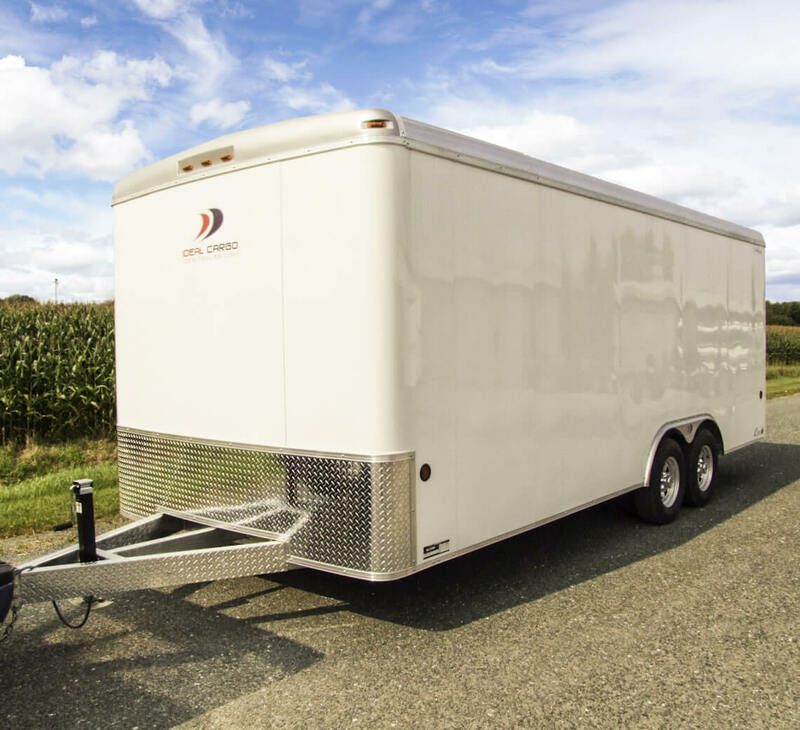 The Classic enclosed trailer is the first model manufactured by Ideal Cargo. It is the pioneer of a series of trailers for different needs. 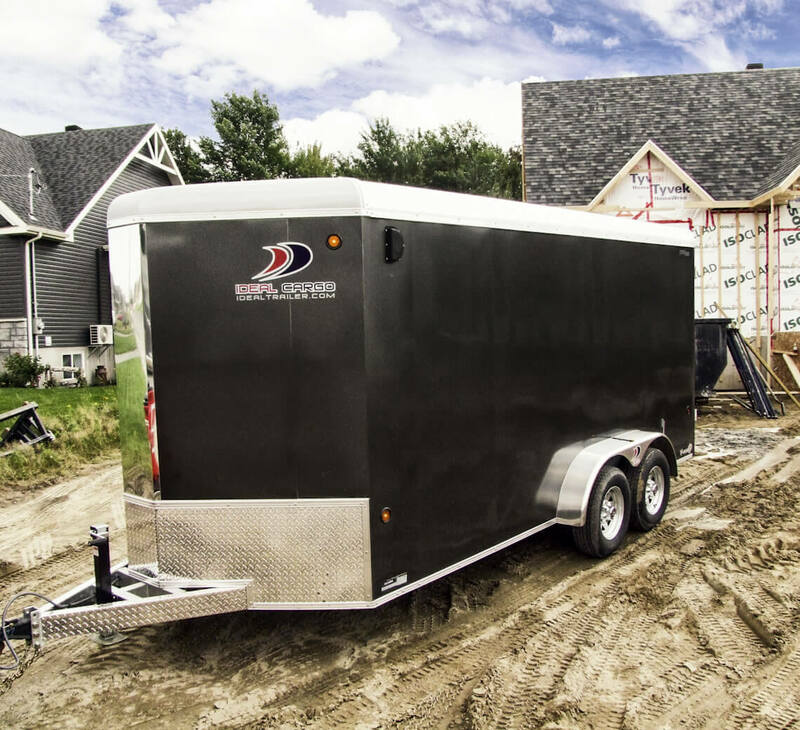 The Classic enclosed trailer distinguishes itself from the competition by the quality of its manufacture and its components. It is our most versatile trailer because it can be manufactured according to the needs of consumers whether it is for commercial or recreational use. Ideal Cargo is a manufacturer of high-quality enclosed trailers. 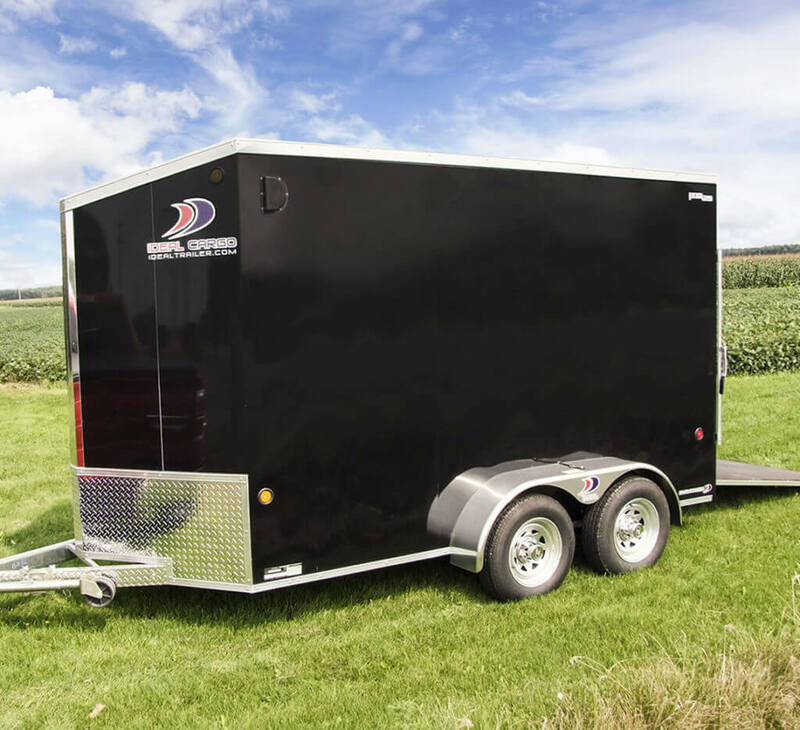 The Revolution model is very popular for customers who are looking for race car trailer, automobile trailer, motorcycle trailer or for many kinds of sports activities, for example, for business owners and recreational event organizers enthusiasts. This commercial quality closed trailer is characterized by its strength, its aesthetics and its flat roof that can be made sufficiently strong to allow the user to walk on it. 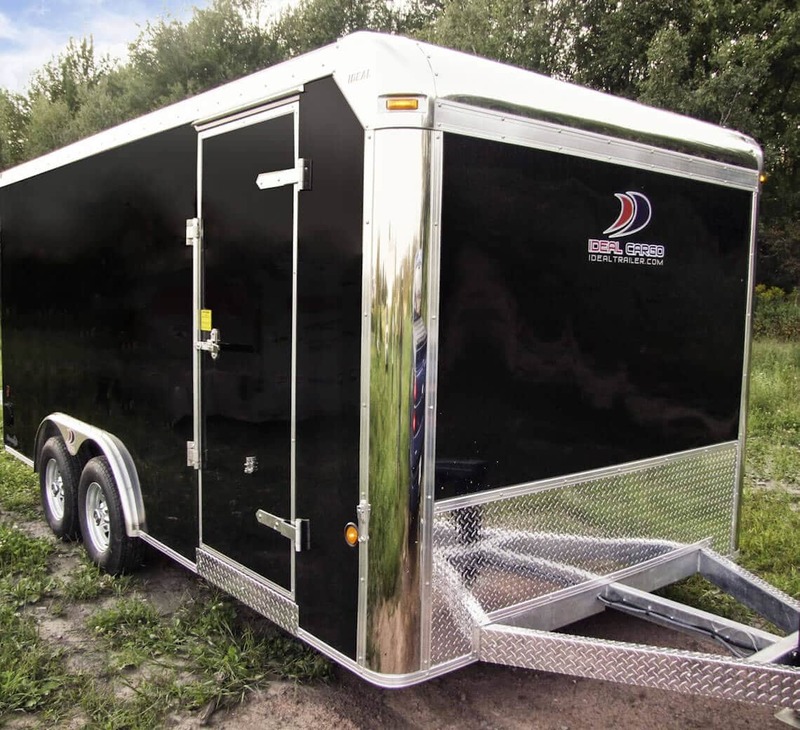 This enclosed trailer comes from the manufacturer with a finish superior to any other enclosed trailers on the market. The corners are stainless steel, polished and have a 4’’ roof moulding and like all of our other models, the frame is fully galvanized. 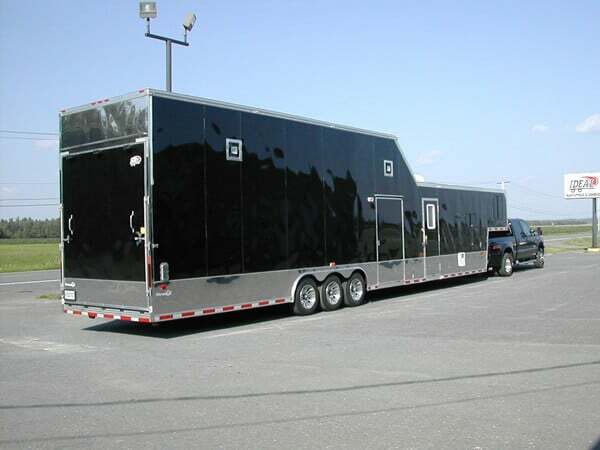 The Revolution enclosed trailer is also greatly appreciated by furniture stores, antique shops and moving companies. The Concord enclosed trailer model has a new aerodynamic design with significant advantages for fuel economy and exceptional road handling. Practical and adapted to transport your motorcycle, ATV or car, the Concord trailer can also be manufactured custom-made. To meet our customers’ many needs, we offer more than 300 options like the stabilizer poles, finishing internal or external, windows, fans, doors, chests, electricity, etc. You can use the front as storage and the rear portion as garage space. Gooseneck or fifth wheel models, supported by Duracore technology, facilitate and enhance driving stability, which is great for heavy duty use. The space above the fifth wheel offers additional storage. Ideal Cargo specialises in the manufacture of custom made trailers according to the needs of the client. Start your new trailer order. Contact us now to order your selected trailer or to get help selecting the trailer that will best satisfy your needs. Sign me up to receive members-only news, tips and discounts.